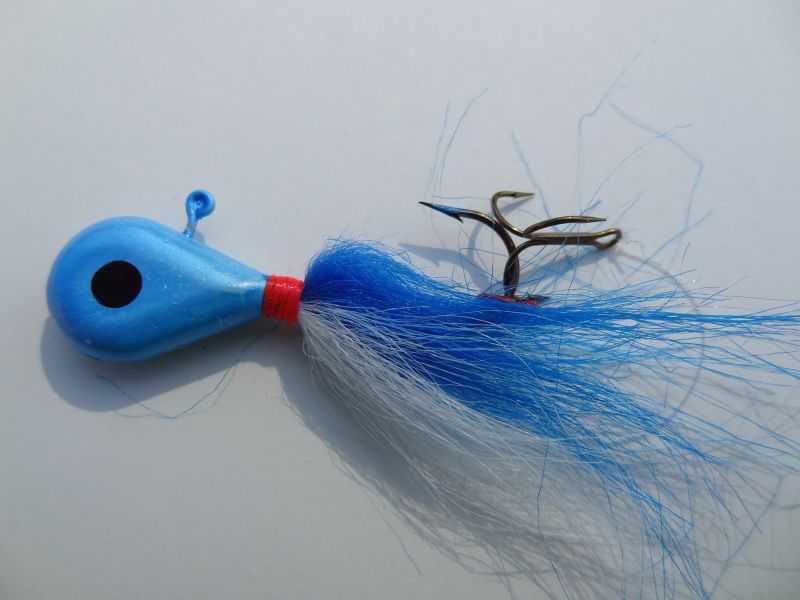 These premium quality jigs have been much copied over the years and they are still our number one seller. 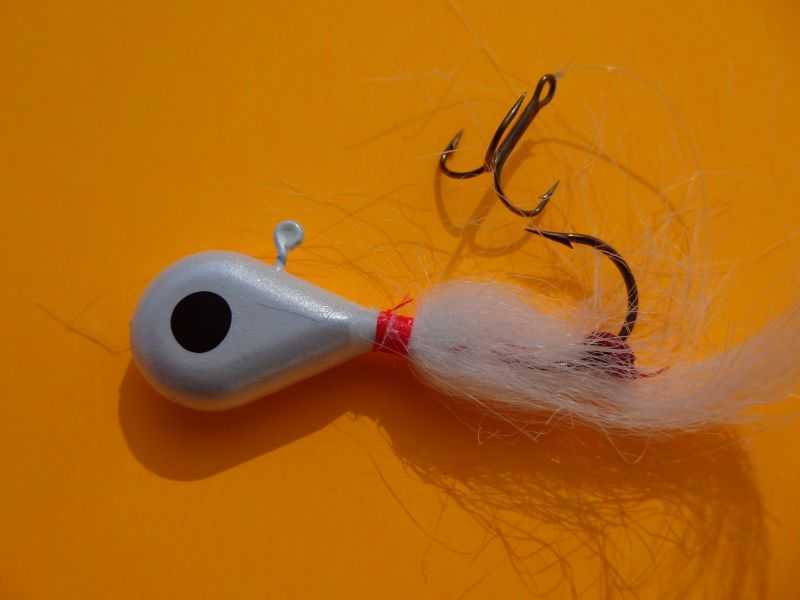 All types of game fish have been snared by this tantalizing lure but Walleyes are its main prey. Be sure to stock up on this big seller and order early. 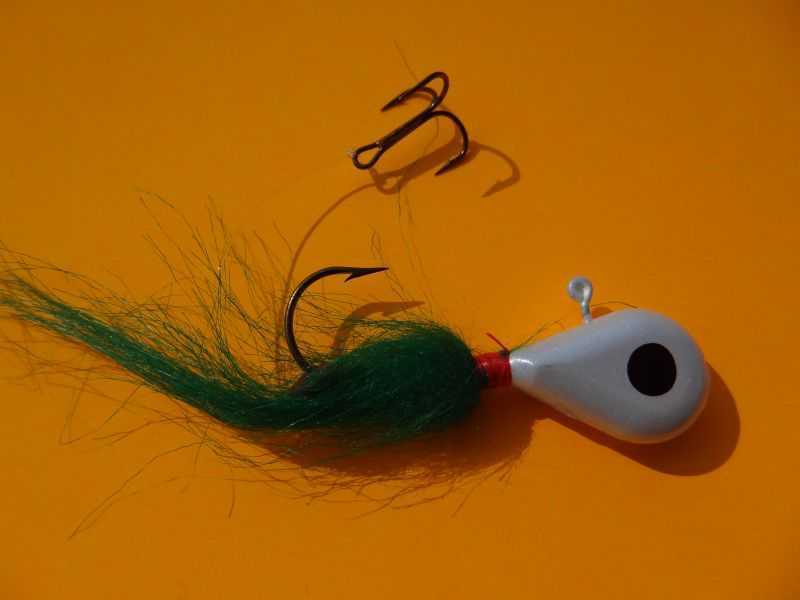 River fishermen find that this jig design overcomes the up-swell of the current better than any other designs, enabling you to use a lighter weight, making the strikes that much easier to feel. 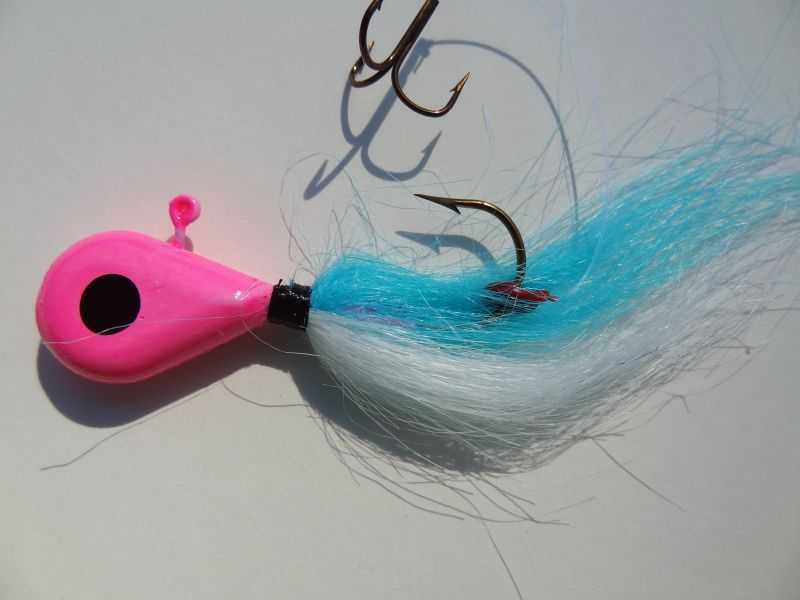 Each one of these lures comes with a proven stringer attached. 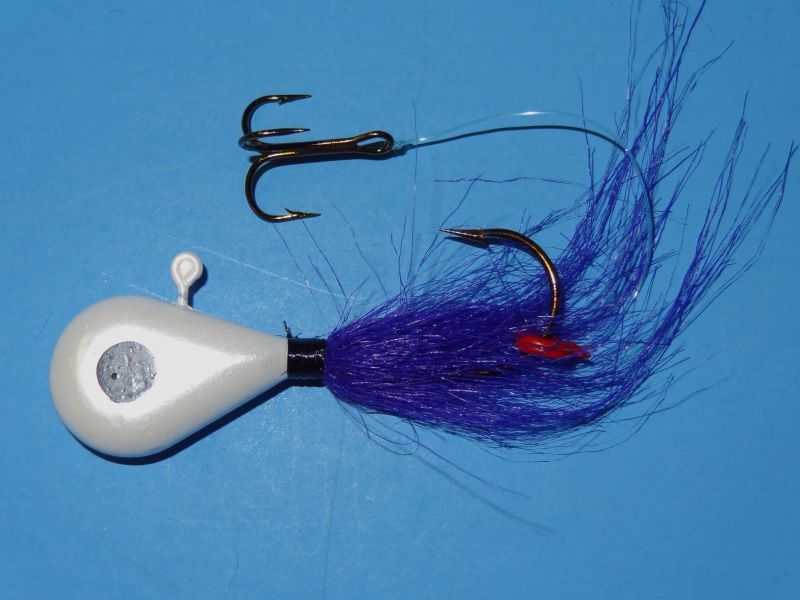 Great game fish and walleye jig with a pearl head and dark purple tail. Available in 1/4, 3/8, 1/2, 5/8, 3/4 and 1 oz. 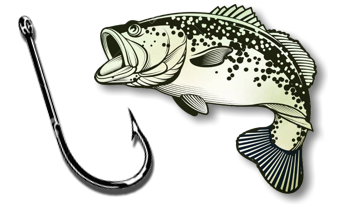 Great game fish and walleye jig with a pearl head and dark green tail. Available in 1/4, 3/8, 1/2, 5/8, 3/4 and 1 oz. 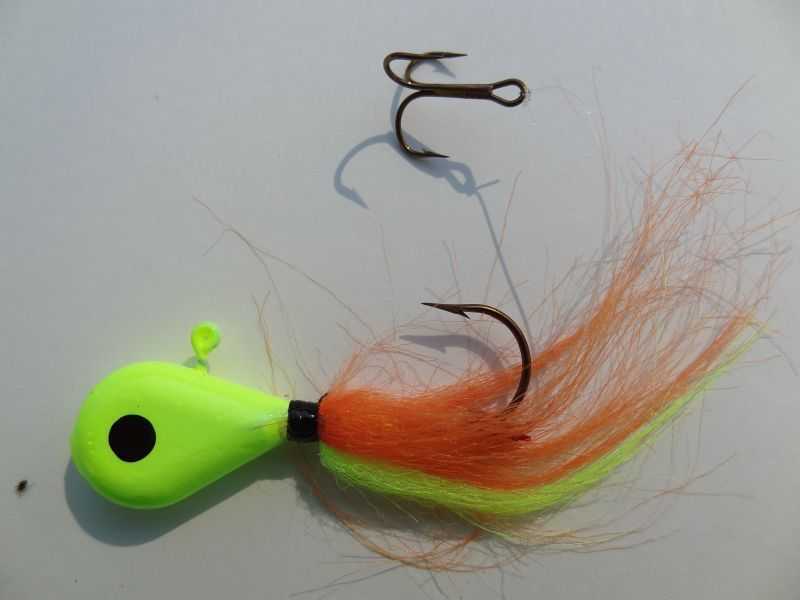 Great game fish and walleye jig with a orange head and chartreuse tail. Available in 1/4, 3/8, 1/2, 5/8, 3/4 and 1 oz. 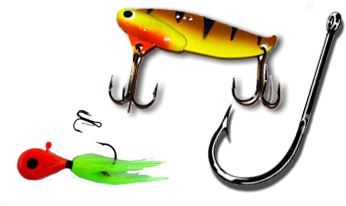 Great game fish and walleye jig with a orange head and red and orange tail. Available in 1/4, 3/8, 1/2, 5/8, 3/4 and 1 oz. 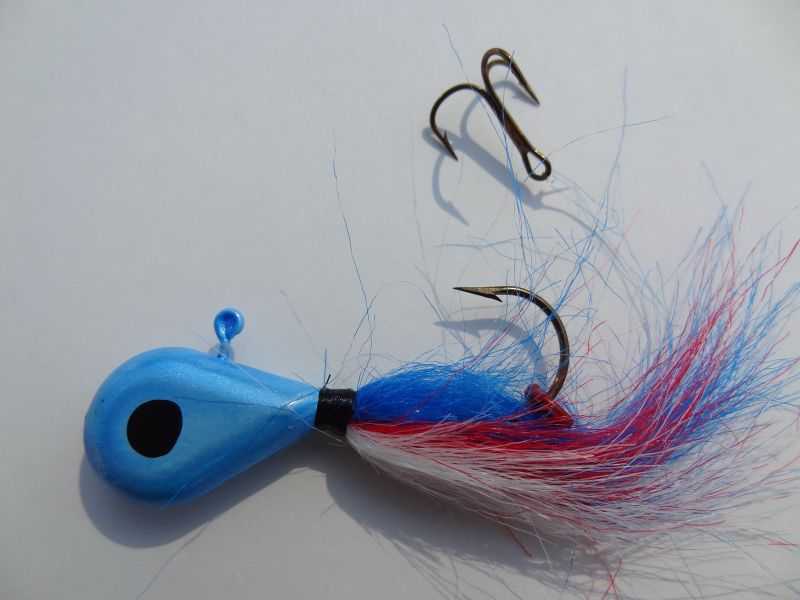 Great game fish and walleye jig with a blue head and blue and red and white tail. Available in 1/4, 3/8, 1/2, 5/8, 3/4 and 1 oz. 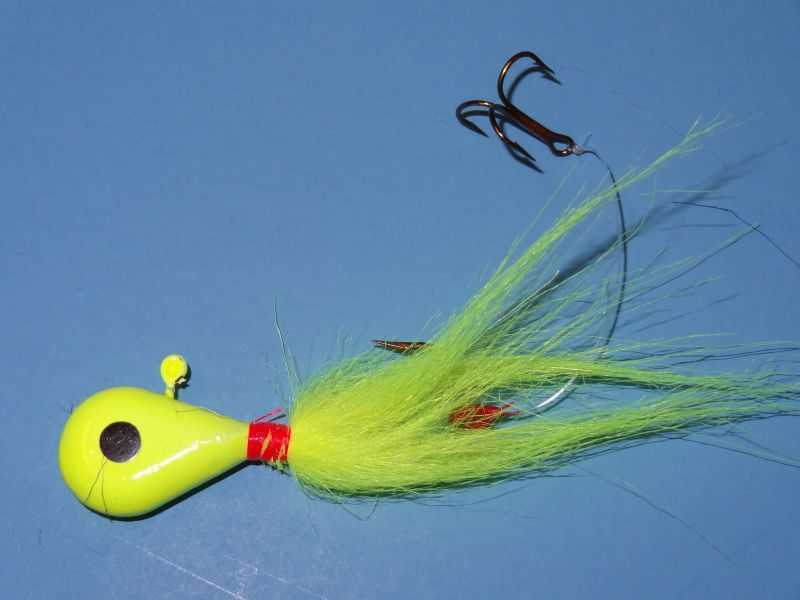 Great game fish and walleye jig with a chartreuse head and chartreuse tail. Available in 1/4, 3/8, 1/2, 5/8, 3/4 and 1 oz. 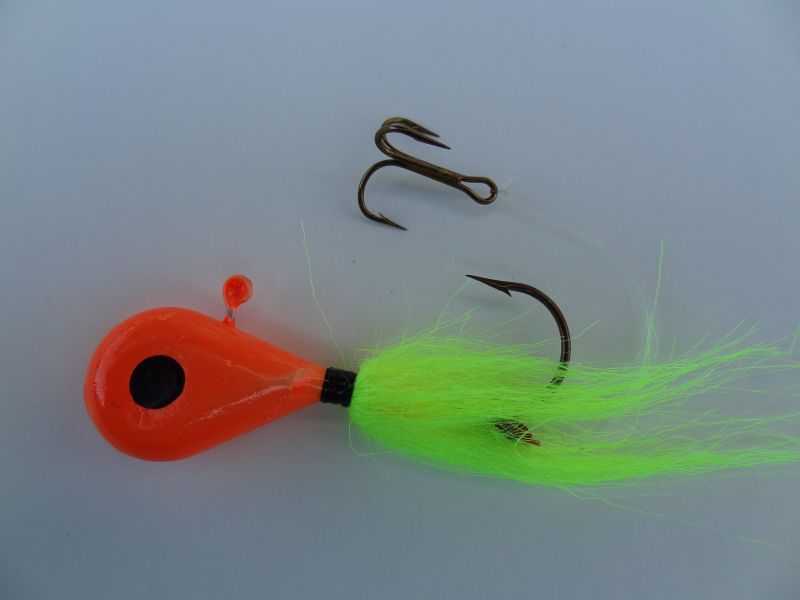 Great game fish and walleye jig with a chartreuse head and orange and chartreuse tail. Available in 1/4, 3/8, 1/2, 5/8, 3/4 and 1 oz. 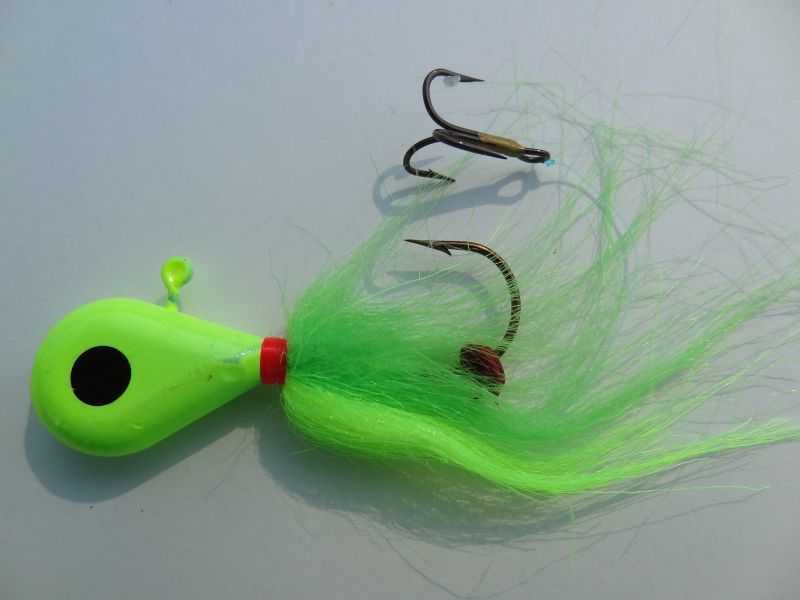 Great game fish and walleye jig with a chartreuse head and mint green and chartreuse tail. Available in 1/4, 3/8, 1/2, 5/8, 3/4 and 1 oz. 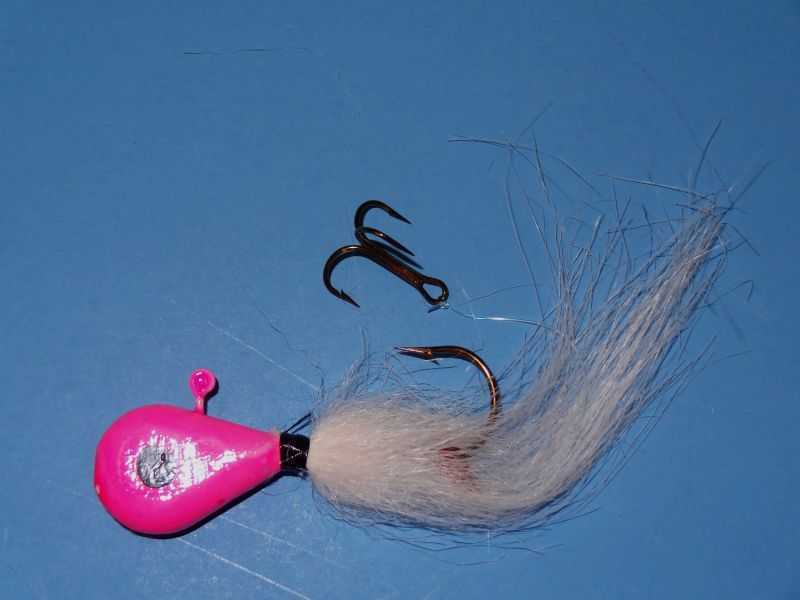 Great game fish and walleye jig with a pink head and white tail. Available in 1/4, 3/8, 1/2, 5/8, 3/4 and 1 oz. 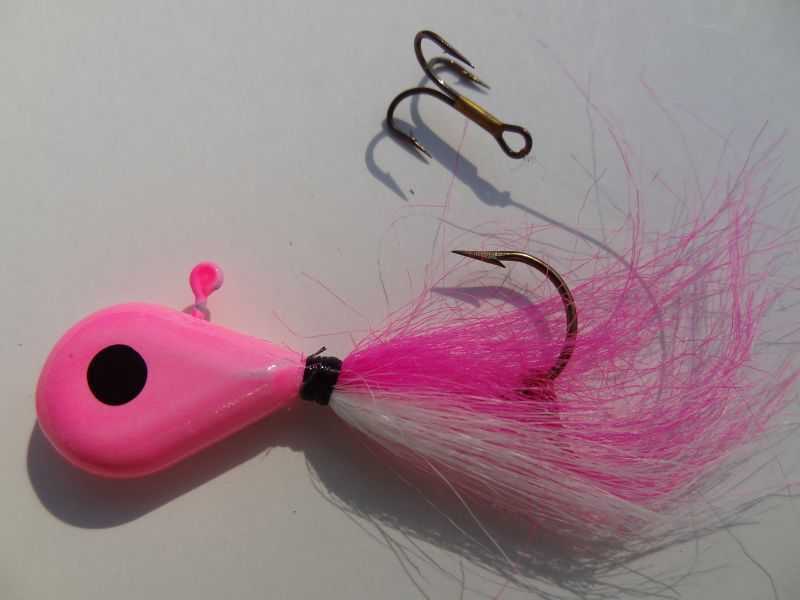 Great game fish and walleye jig with a pink head and pink and white tail. Available in 1/4, 3/8, 1/2, 5/8, 3/4 and 1 oz. 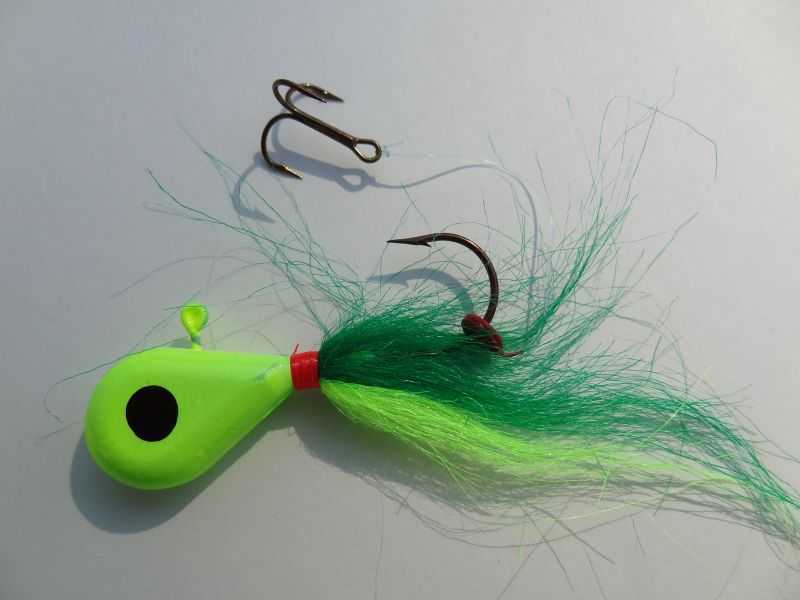 Great game fish and walleye jig with a chartreuse head and dark green and chartreuse tail. 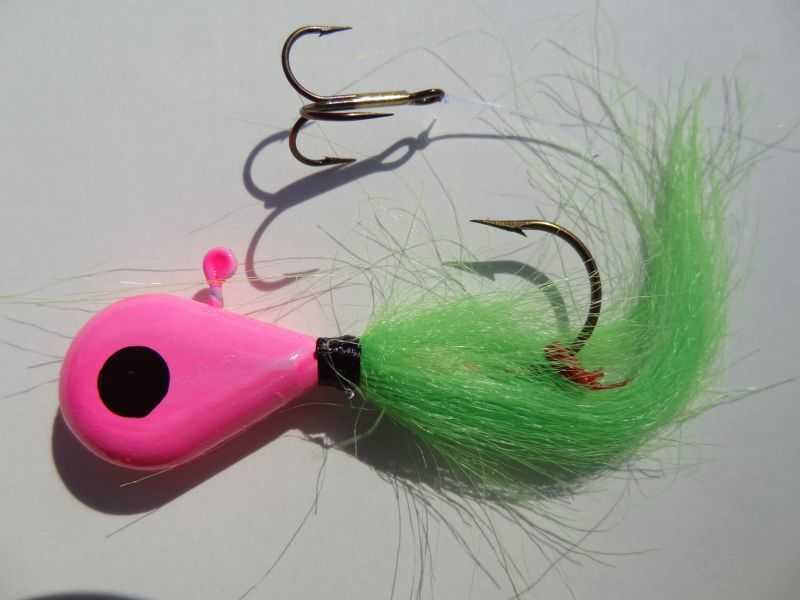 Available in 1/4, 3/8, 1/2, 5/8, 3/4 and 1 oz.